Few changes occurred in the land use of the parish, though this was a period that saw many agricultural improvements, in an age of ‘gentleman farmers’. However, Merton’s most famous resident was not a farmer, though he was proud of his ‘little farm’. in 1801 Admiral Horatio Nelson purchased Merton Place, a small house in Merton, together with 50 acres (20ha) within Wimbledon parish on the opposite side of the High Street. The following year he bought a further 113 acres (46ha) adjoining his house in Merton, the remnant of Merton Grange. 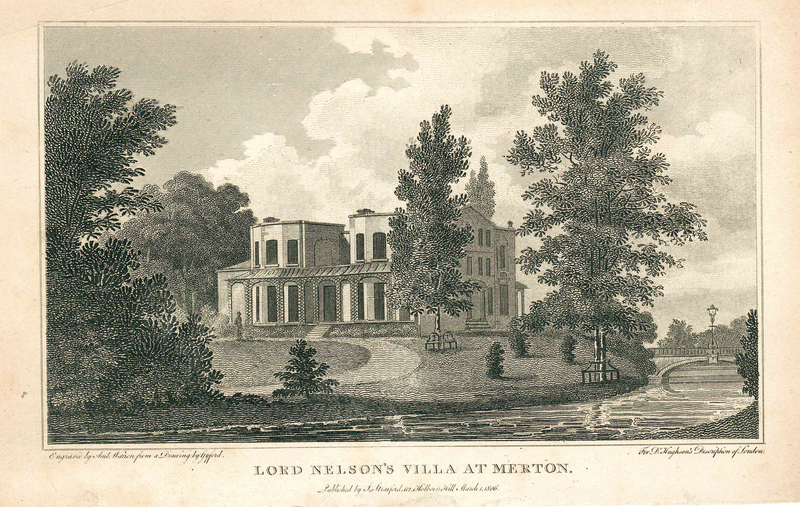 Nelson died at Trafalgar in 1805, and much of the estate was sold to pay his debts, but he left the much-enlarged house and 70 acres (28ha) to his mistress, Lady Hamilton. However, her own debts soon overtook her and a consortium of friends bought her out. The house was demolished by 1817 at the latest, to make room for a proposed development of gentlemen’s villas, but the project failed and instead ‘Nelson’s Fields’ became Victorian terraced housing, now replaced by the High Path estate. Previous owners of Merton Place included Sir Richard Hotham (see Bulletins 143, 157 ), founder of Bognor, and Charles Greaves (see Bulletin 149), a textile printer. Next to Merton Place, at Abbey Gate House, within the former priory precinct, lived Charles Smith, with his brother, Admiral Isaac Smith (see Bulletins 124, 125, 153), reputedly the first European to set foot on Australian soil during Captain Cook’s expedition. Cook’s wife was a cousin of the Smiths. Of more humble beginnings was James Lackington, son of a shoemaker, who made a fortune in the second-hand book trade. He lived at Spring House in the 1790s, where he wrote his Memoirs. The Wandle, always important for its corn mills, also became a focus for other industrial activities, especially those concerned with textile trade. 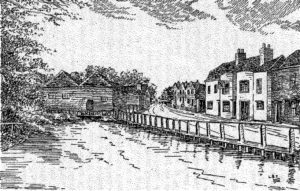 There were bleaching fields beside the Wandle, both inside and outside the former priory walls, used by ‘whitsters’ from the 1660s for bleaching linens and calicoes, but by the mid-18th century (and reputedly by 1724) a calico printworks was established within the precinct, on the site of the present Merton Abbey Mills. A secondary establishment was formed in 1800 a little to the south which became known as Bennett’s Mill. These two works were later taken over by Littler in 1833 and then by Liberty in 1904. Meanwhile, in the early 1750s, another printworks was established just to the south of the High Street, which would be eventually taken over by William Morris in 1881. Predecessors to Morris were James Halfhide (see Bulletin 175), captain of the Merton Abbey Volunteers, William West c.1805-1812 and Thomas Welch (see Bulletins 141, 142) 1846-1881. For more details on the Wandle industries see Peter McGow’s notes on the Wandle Industrial Museum website http://www.wandle.org.uk/mills/millsindex.html. Engraving of the Copper Mills and King’s Head, Merton, published 1925. Adjoining the latter printworks was a pair of copper mills, on the site of the priory’s two Amery mills. 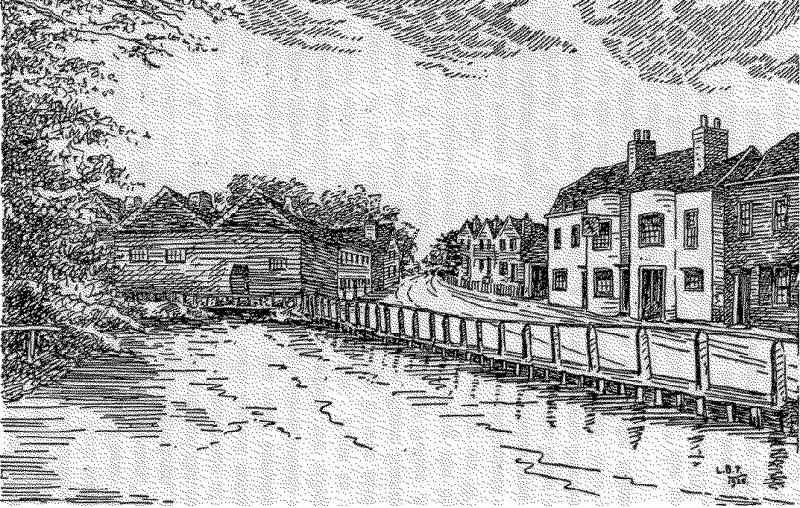 By the 1660s the mill on the left bank was being used for the grinding of Brazil wood and other materials to produce dyes, but in the 1720s the corn mill on the right bank was converted to copper production, and by the 1760s both buildings were copper mills, using the Wandle to power hammers, rollers and bellows. This site is now occupied by Sainsbury’s and Marks & Spencer.